Great shoes...very comfortable. One of my better purchases. Wonderful craftsmanship and overall comfort. The shoe is light, sophisticated, warm and all O get is compliment and where did you get this shoe? Absolutely love these. My new favorite zerogrands I own. I love this shoe, I haven't had anything that looks as formal as this shoe feel this comfortable. Who said you can't look as good as you feel. Bought these for my husband for Christmas and he lives them! Very comfortable and he has received tons of compliments on the style and look if this year! Most comfortable shoes I’ve ever worn. Highly recommend the shoe. It gets a lot of compliments or questions about where I got it. I would order a size smaller than you typically get though, or else you will feel like you are walking around in a clown shoe. I sized-down and is still a little too long. Other than the fit though, very good shoe. Light weight with Heavy weight results!! I definitely recommend this shoe. Very comfortable and stylish. Everytime I wear this shoe I receive compliments. You can't go wrong with this heavy hitter with a light weight feel. Very good looking shoe, wearable to a business casual office or out on the town. Fits well, is very comfortable and warm. I have 8 pairs of Cole Haan Zero Grand and Grand OS shoes, 3 of which are these Stitchlites. Yes they are comfortable in any regular situation, sitting down for example. However, I'm shocked no one has mentioned the one major flaw these shoes all have. They CONSTANTLY feel like they are going to slip off of your ankle while walking. In turn, you have to walk in a style almost like you do with flip flops. It forces you to curl your foot in a certain way so that they don't fall off of your ankle. This means they are practically impossible to run in if the occasion called for it, and walking any distance over a couple hundred yards can be quite annoying. It also means you can't wear ankle socks with this as within 30 seconds of walking they will pull your sock down over your heel since the back section is so loosey goosey. I wish it wasn't the case because I really like the shoes otherwise, but I can only wear them for certain occasions really. These are the most comfortable shoes I have owned. I only wish they were available in wide, but they will stretch to fit. Love these shoes. Lightweight, comfortable and the fit is perfect. The wool is flexible and warm. Love every pair of my ColeHaans! I’m on my 3rd pair of stitchlites and l totally love them... People always ask what are those shoes your wearing everytime l wear any pair! I just tell them.... These are ColeHaans, you better catch up! Great shoe. Like wearing a sock. This is my second pair and I love them. They feel like you have nothing on your feet. Highly recommended. After seeing this shoe on a seatmate during a flight and hearing his exuberance about how light and comfortable they were, I decided to give them a go. Very happy with design, fit and feel. A great shoe to go from casual meeting to casual dinner. Often while working I am on my feet for 9-12 hours with few breaks. The light weight of this shoe made even the first couple times wearing a great day. Already looking at other colors, soles. These shoes are really comfortable and look great too! Excellent shoe. 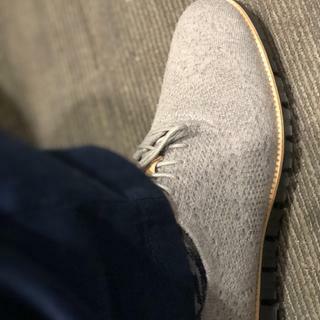 Very light and comfortable, but was mostly impressed with how stylish they are. Sleek and sharp, not bulky at all. I think it has a stylish look and I hear that they are very comfortable. I bought a black pair a few weeks ago while in NYC and love their comfort plus casual-dressy style. Looks comfort and goo color. I think the wool will be very comfortable and believe that these will look good with fall/winter clothes. Wanted to try this shoe. I choose this due to the color combination of light grey, tan, and black soles. Nothing has more subtle style than this combination. Smart, stylish and comfortable. Always like having a gray pair in the house!! Superfragilisticexpialadociously awesome pair of shoes. Get yours..! I love how they look and the weight makes for a great choice when you are at all day long business conferences. These are brand new, and I wanted to get them for my husband. BEST ANSWER: They're warm, but they're not waterproof. Is the trim color more of a beige or a lighter tan unlike the previous versions non-wool type that was more of a brown tan trim ? It is a very light tan. They definitely feel like they can be removed. They're glued to the inside of the shoe. I don't want to remove mine to find out. The shoes are extremely comfortable although the insoles themselves are really thin (in the front). I hope this helps. how do I know this is merino wool not regular wool? BEST ANSWER: Enter an answer to this question.Stitchlite™ Wool product is comprised of:43% merino wool / 23% nylon / 14% alpaca / 20% monofilament nylon. I am in the clothing business. I own 2 pairs of these shoes. The wool is merino and the shoes are extremely comfortable. If i buy the shoes here in the page,can í pick it Up in one of your store? BEST ANSWER: Sorry, no. If you do that, someone might sell them! Please use your home, office or other postal delivery address for shipment (not a PO Box).